The jolly Christmas season is approaching thick and fast so it's time to start preparing your gift ideas for the man in your life. Whether it's a boyfriend, husband, brother, father or grandad, this comprehensive 5-step list could make a great collection of gifts for the clean-shaven gentleman in your life. 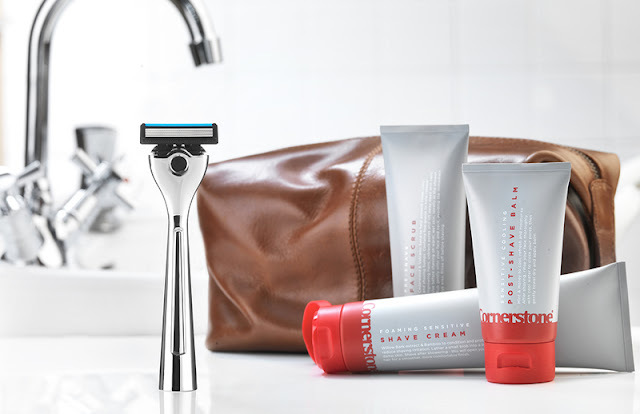 Cornerstone's new razor has five super sharp, fine blades, optimally spaced to increase shave performance and reduce clogging, an Aloe Vera strip to help the blades glide smoothly, as well as a new precision trimmer blade for those hard to reach areas. Each blade is made from Japanese chromium steel to reduce micro-corrosion of its cutting edge and coated with a layer of titanium and diamond grade carbon to ensure the cutting edge stays sharper for longer. Please note, although their razors are perfect for your face, we do not recommend using them for head-shaving. It's important to always wash your face in the morning as during the night your skin goes into 'repair mode' and will withhold oil which can prevent your normal daytime products (such as your Daily Moisturiser) from working properly. Using Cornerstone's Face Wash is an oil-free and sensitive daily face wash blended with mint and cucumber extracts to deliver a gentle yet invigorating clean. It removes excess dirt and impurities from your skin to make your skin feel energised and refreshed in the morning. Cornerstone's foaming sensitive shave cream combines a blend of willow bark and bamboo to provide a rich foaming lather to condition and protect your skin whilst you shave. The natural willow bark extract, known for its anti-inflammatory property, helps to reduce shaving irritation leaving your skin smooth and ready for the next step. Used after shaving, Cornerstone's Post-Shave Balm cools, refreshes and moisturises - helping to restore your skin’s natural moisture balance and reducing irritation. Blended with mint and honey extracts to soothe and condition. As with the scrub, if you’re not used to a post-shave balm – we’re pretty sure that once you’ve given it a try, you won’t regret it. Travel in style with Cornerstone's leather wash bag. Every wash bag is handmade using tough, distressed buffalo leather, which will soften over time to give a distinctive, stylish character. The interior waterproof lining will keep all your travel essentials safe, while the smaller zip pocket keeps things organised.